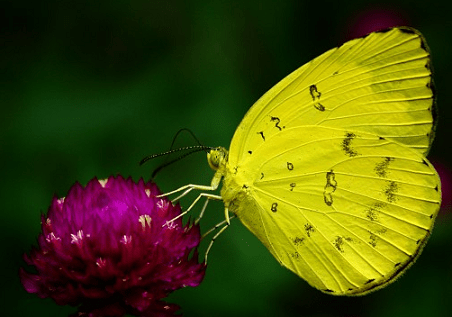 Common Grass Yellow butterfly (Eurema hecabe) – complete detail. 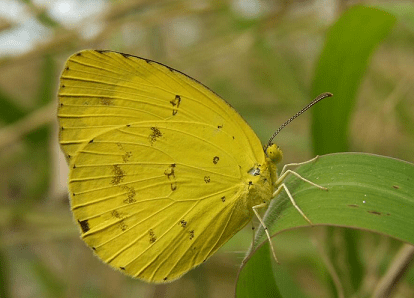 Description of Common Grass Yellow butterfly – Eurema hecabe. 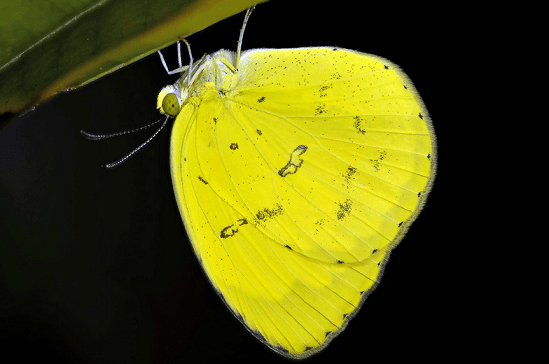 Classification of Common Grass Yellow butterfly (Eurema hecabe). Habit and habitat of Common Grass Yellow butterfly (Eurema hecabe). They prefer open forest areas, wastelands and grasslands. They also found along roadsides and riverbanks, and in parks and gardens at elevations between sea level and about 1000 metres They are found flying close to the ground in open grass and scrub. Their habit of gathering in small groups on patches of damp sand or soil. Male butterflies are often seen in large groups, and the females usually fly about by themselves to find nectar from a wide variety of plants……….. They have a wingspan of 35 to 45 mm. 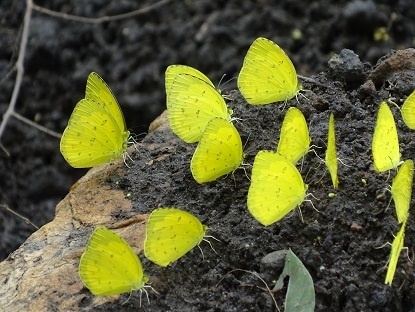 Common Grass Yellow butterflies are small in size. The female is larger and a paler yellow, with broader black but diffused markings on the upper sides of both wings. In the larvae stage the color of body is dull green with a white line edged with yellow, and the color of head is green. The larvae of this species feed on a variety of plants and grasses, depending on the region, although they often include plants from Euphorbiaceae, the family of spurges, and Fabaceae, the family of legumes, peas and beans…………. They like to fly quickly, close to the ground, are found in open grassy or bushy terrain, hence their name. They regularly visit flowers for nectar and puddle on wet grounds for minerals. 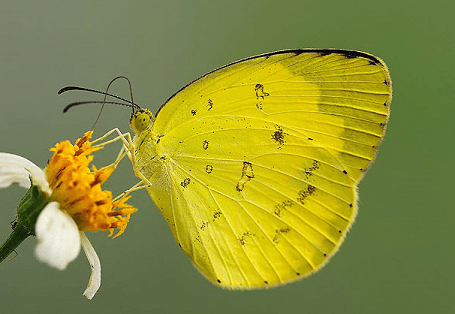 Eurema hecabe is a beautiful yellow butterfly. They have a wingspan of 35 to 45 mm. Common Grass Yellow butterflies are small in size. They have bright yellow wings, with blackish brown bordering on the upper side and the underside of the wings are paler yellow with brown speckles. They have a narrow black band on the hind wing. They have different coloration in their wings depending on the season. Males have a brand lying along the cubital vein on the forewing underside. The female is larger and a paler yellow, with broader black but diffused markings on the upper sides of both wings. There are typically two cell spots on the forewing – a characteristic that is mainly used to identify the lookalike species in the genus. In the larvae stage the color of body is dull green with a white line edged with yellow, and the color of head is green. The larvae of this species feed on a variety of plants and grasses, depending on the region, although they often include plants from Euphorbiaceae, the family of spurges, and Fabaceae, the family of legumes, peas and beans. In the pupa stage the length of body is between 16 to 22 mm. The pupa has a pointed head and a keeled wing pad, and its body is mostly unmarked except for a faint pale brownish and narrow dorsal band. Ordinarily the pupa is solitary and green, but sometimes on a twig in large numbers. They found throughout most of Asia, Africa, Madagascar, Saudi Arabia, India, Sri Lanka, South Pacific islands, Australia, and the Solomons to Fiji and Tonga. They prefer open forest areas, wastelands and grasslands. They also found along roadsides and riverbanks, and in parks and gardens at elevations between sea level and about 1000 metres. They are found flying close to the ground in open grass and scrub. Their habit of gathering in small groups on patches of damp sand or soil. Male butterflies are often seen in large groups, and the females usually fly about by themselves to find nectar from a wide variety of plants. Males congregate to imbibe mineralized moisture from damp sandbanks, often in scores. Females are more discreet in behavior, normally being seen singly when nectaring. The eggs of the Common Grass Yellow are laid singly on a leaf/leaflet of the host plant and whitish in color and has quite a few shallow vertical ridges and indistinct horizontal striations.Eggs are always spindle-shaped, and changing to a darker shade before hatching. The caterpillars when first hatched are green, cylindrical, and covered in tiny tubercules from each of which arises a single long stiff hair. In later instars these hairs become progressively shorter. The caterpillars feed on the young and tender leaves of the host plants. After hatching, the young caterpillar eats the empty egg shell for its first meal, and then moves on to eat the leaf lamina for subsequent meals. 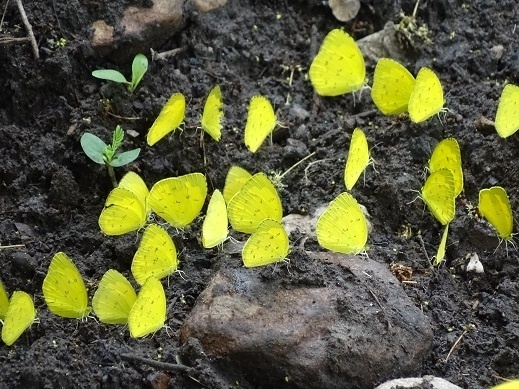 The body color turns yellowish green as growth progresses.